TOP OF THE MORNIN’ TO YA! LUCK OF THE IRISH!! HAPPY ST. PADDY’S DAY!!! WOOOO! Yeah… I’m not really that into this holiday. Notwithstanding my name, I’m not Irish and, if we’re being totally honest here, I suppose I’ll just admit that I don’t really know who St. Patrick was or what he did to land himself a holiday. To me, St. Paddy’s Day is less of a holiday and more of an excuse for dressing monochromatically and day-drinking. Which is fine by me. I’m just saying. At any rate, if you’re interested in paying homage to St. Patrick in a way that doesn’t involve salacious t-shirts or green beer, I know of something that may help. 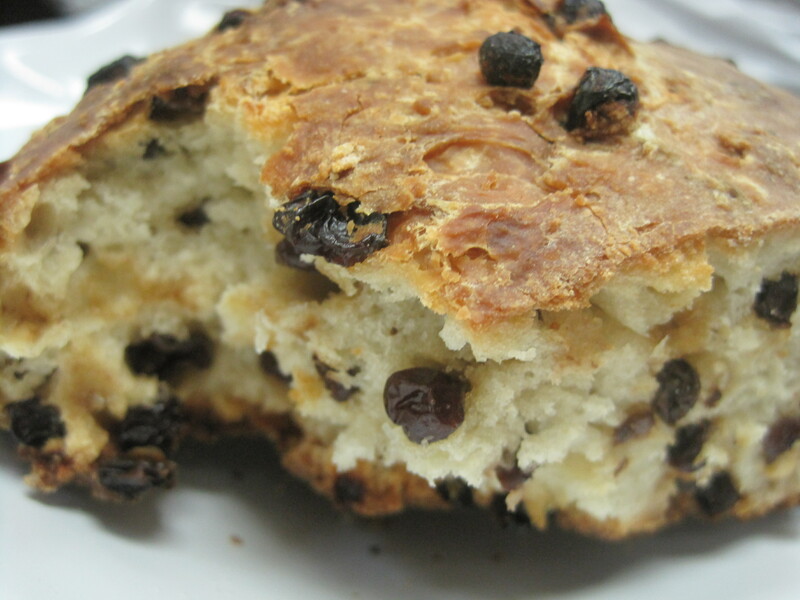 It’s called Irish Soda Bread. I recently thought that I didn’t like Irish Soda Bread, until we made it at school and I promptly scarfed down an entire loaf. You’d think there’s something off-putting about the combination of caraway seeds and dried currants, but it’s actually kind of inspired. And it turns out that the term Irish Soda Bread is a bit misleading, given that, in texture and crumb, this loaf is exactly like a giant scone. Even if you’re not into day-drinking, don’t you think this sounds like something you can get behind? Erin Go Bragh, Lads! This makes enough dough for two 6-inch round loaves. Make two, freeze one? Or eat both. I won’t tell anyone. Combine the all-purpose flour, salt, baking soda, and cream of tartar in a large bowl or in the bowl of a stand mixer with a paddle attachment. Cut in the butter, using two knives or a pastry cutter, or the paddle attachment of a stand mixer, until the butter is the size of peas. Add the currants and caraway seeds. Add the buttermilk, and mix just to combine. The dough will still look a bit shaggy, but that’s okay. Shape the dough into two round loaves, and cut a deep, broad “X” in the top, approximately 1 to 1 1/2 inches deep. Bake the loaves on a large sheet pan (or two), lined with parchment paper, for 30 to 40 minutes, until a brown crust forms and a skewer comes out clean. Enjoy with a few pats of soft butter. And a green beer, if you’re so inclined.